Sharpsville Container’s fifty-eight liter container is one of the newest additions to our extensive line of products. 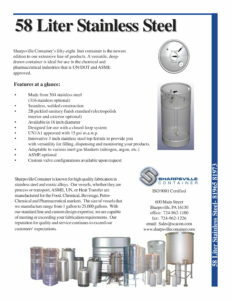 This versatile, deep-drawn container is ideal for use in the chemical and pharmaceutical industries and is UN/DOT and ASME approved. UN1A1 approved with 15 psi m.a.w.p. Innovative 3 inch stainless steel top ferrule to provide you with versatility for filling, dispensing, and monitoring your products. Sharpsville Container is known for producing high-quality containers using stainless steel and other exotic alloys. Our vessels are used for in a variety of industries like chemical, pharmaceutical, beverage, and more for uses spanning process storage, material transportation, spraying, and more. We even manufacture tanks up to 25,000 gallons in capacity. Get in touch with us today to learn about how we can create standard or custom-designed solutions for your needs. 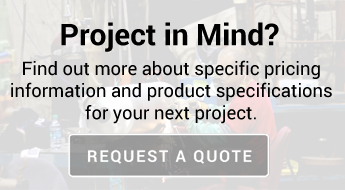 Request a quote or contact us here!